I've been to Alabama just once. Over 10 years ago, I was visiting my bestest friend in the whole world, who was living in Biloxi, Mississippi at the time. She suggested that instead of going to New Orleans again (I was thinking more along the lines of why wouldn't we go back to NOLA? ), we should go to Mobile, Alabama for the day. And so we did. Little did we know that pretty much nothing would be open in Mobile on a summer weekend when almost everyone was at the coast instead. I was underwhelmed. However, on the drive back we stopped at the beautiful Bellingrath Gardens and it made the day worth it (well, almost. I remember still wishing for beignets). The gardens were beautiful! 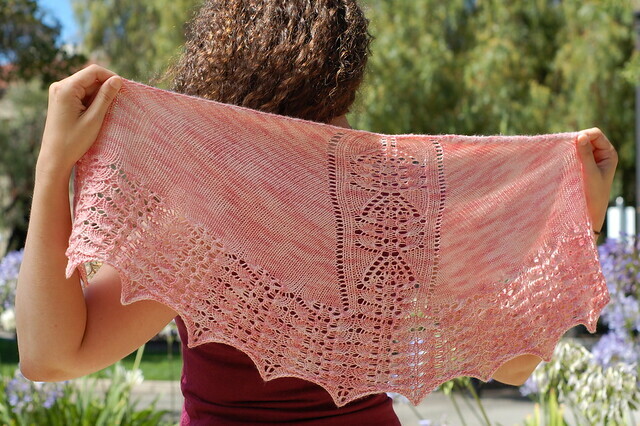 This shawlette and sock design, Bellingrath, was inspired by both those lovely gardens and the perfect Blush color yarn, Sock-a-licious, from Kollage Yarns in Alabama. The shawlette. One skein, gotta love that! And I just have to say, my model and photographer....LOVE THEM! I really have some of the best friends a knitter could have. Ilikecake (you may know her by her gorgeous sock designs) worked the runway (well, garden in this case) while Cheekyattitude worked her magic behind the camera (you can check out more shawlette pictures here). The socks feature the same lace edging and panel. I'm pretty tickled with how that works :) They are modeled perfectly by Cupcakefaerie! Again, what would I do without my friends. 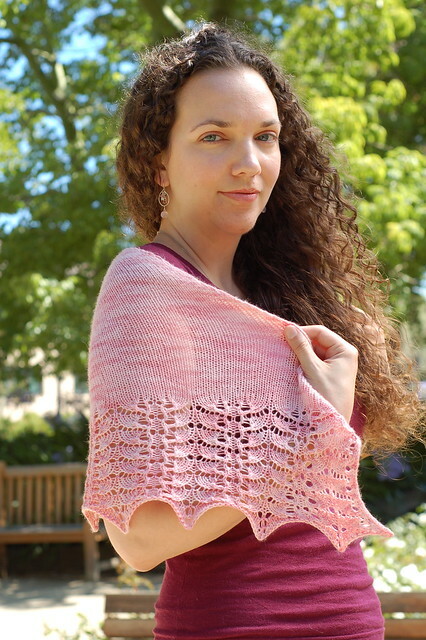 But if you want to cast on right now, or can't make it to Stitches Midwest, Patternfish is carrying the pattern and you can download it now here (I am just so excited!). You know the saying about it takes a village? Well, this design will always be very special for me. It really has taken a village. Erica for challenging me to this creative process (a shawlette? sure, no problem, never knit one, let alone design one....in five weeks...no problem!). Thayer and Terry for modeling. Tricia for her gorgeous photos. And my two awesome, who knits as fast as them, test knitters, Manda and Madeleine (I practically cried with relief when they agreed to test knit under very very tight deadlines). Of course, Susie from Kollage for giving me this exciting opportunity! Now that the secret project is out, I can't wait to get back to showing you all what else I'm working on. 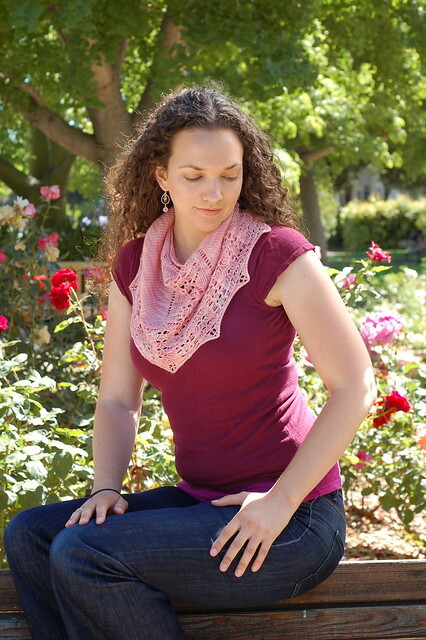 Come back this week for more knitting, a pattern sale (yay! ), and a contest or two! This set turned out gorgeous! So happy that you wanted to design for Kollage Yarns. You exceeded our expectations! 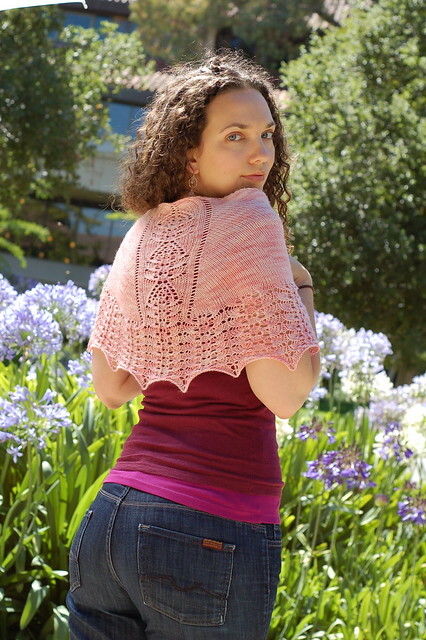 And I love that pink yarn! WTH? I'm turning into such a girl! Ha ha! Really gorgeous! Congratulations to you! Love 1000! Oh my Gawd Carie, this set is sooooo gorgeous! Those are AWESOME! Excellent work! Stunning! 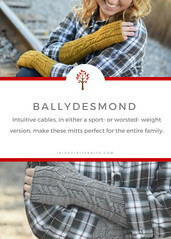 I saw them on Ravelry last night, but you have more photos. Ooooh, ahhhhh! They're stunning! What a beautiful shade of pink. Congrats on the new patterns! LOVE LOVE WANT WANT!! Will you have this up on Ravelry after Stitches Midwest?? I have the most perfect skein of yarn for the shawlette! What a gorgeous set!!! Just exquisite!! The background story is wonderful! Have a fabulous time at Stitches!! Beautiful! Both of them! Well done, you. I know we gave you such a short deadline for this design, but you went above and beyond! 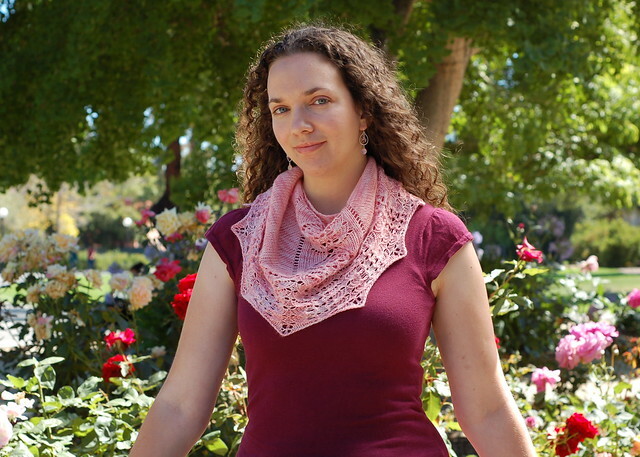 I love pattern sets and I think the sock/shawlette combo is so unusual and perfect for your lace pattern. 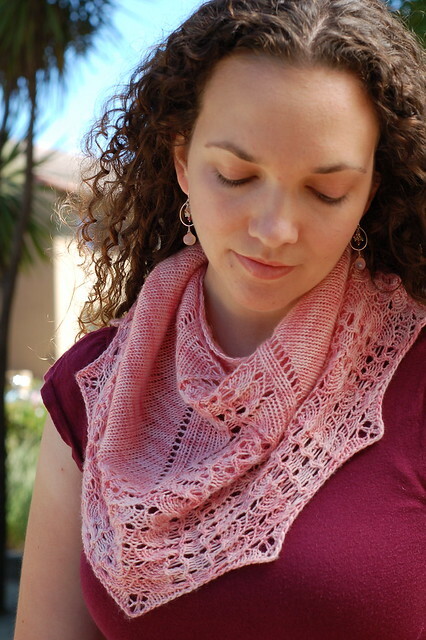 I am so proud of you and I am thrilled that you are part of our STITCHES Midwest booth. Simply stunning. 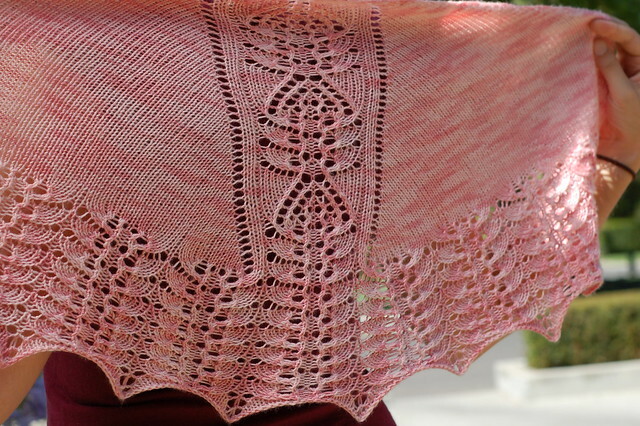 As I told you before, that shawl design is genius. I wish I could be at Stitches MW for your signing. I'll be there in spirit. Congratulation. Oh Carrie, that's absolutely the most gorgeous socks and shawl set ever! You're not going to get a minute's rest at Stitches; hope you're prepared for all the adulation! Oh. Oh my. Must have. They're both stunning! Stunning. Really, truly stunning. Congratulations!!! Just beautiful!! I had no idea about the socks too! I'm so happy for you!!! Love the post and how special is this set of patterns you rock. What a fun surprise! A shawlette. And ironically, I'm knitting my first one ever. I can't believe you whipped that up in 5 weeks. Gorgeous! Just gorgeous! The sock pics didn't open for me, but I'll try again later. I know they're going to be pretty, too. The design is stunning genius - I really love how it works up. Beautiful! I wish I was going to be at Stitches with you - I'll be there in spirit. Tweet lots! Wow, sweetie, those are GORGEOUS! Love them both! Favorites so far from STITCHES!